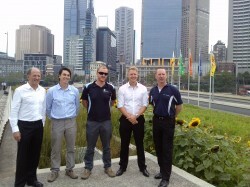 Today marked the official opening of the Birrarung Marr Stormwater Harvesting Project in the City of Melbourne. The scheme captures and treats stormwater from a 37 hectare catchment area for irrigation of the surrounding parkland and avenues along the Yarra River. In addition to reducing potable water use, the project will assist the City of Melbourne to meet the pollution reduction and alternative water source targets set out in its newly adopted Total Water Mark Strategy. The Birrarung Marr project is one of three stormwater harvesting systems to be installed as part of the Eastern Melbourne Parks and Gardens Stormwater Harvesting Scheme, supported by funding from the Australian Government’s Water for the Future initiative. The remaining schemes, in Fitzroy Gardens, Alexandra Gardens and Queen Victoria Gardens, will also be completed this year.